The project strands for the Harnessing of the Criminal Corpse Project. Although criminal justice historians have analysed the physical and public nature of punishment in the period before the reforms of the early nineteenth century, there is little research on punishment after execution. The two main forms of post-execution punishment in Britain – hanging in chains, and dissection and anatomisation – were in use in a limited way by the seventeenth century but peaked in the period between the introduction of the Murder Act in 1752 - which first established dissection and hanging in chains as a systematic punishment for murder - and its repeal in the 1830s. Using this period as its primary focus, Strand 1 will investigate the ways in which the social, symbolic, and even political powers of the criminal corpse were harnessed for the ends of criminal justice. The skeleton of Elizabeth Brownrigg, displayed in a niche at the Royal College of Surgeons. Engraving. Dr Tulip's Anatomy Lesson on the body of the criminal by Rembrandt (1632). Image courtesy of Wikimedia Commons. The dissection of dead bodies has been one of "medicine's defining practices, the symbol of its commitment to science, its power to transform and control nature" Historical opinion however differs about whether the dissected body was an object of entertainment, a new mode of natural historical enquiry, or a grisly spectacle. The criminal body could be both medical commodity and material locus of public engagement. At Cambridge, for example, corpses were cut for three audiences. The medical fraternity first studied each cadaver's medical features; educated townspeople next paid a fee to view the lifelike qualities of the skeleton; finally the crowd bought tickets to watch the punishment of deviance "dissected to its extremities". Led by Professor Sarah Tarlow, Strand 3 complements the research of Strand 2 by tracing the journey of the criminal corpse towards the contexts of display on the gibbet and in the museum, and through to its ultimate burial. After execution, transport, dissection or exhibition, where does the body end up? Archaeological and landscape studies of these questions help us to examine popular and non-discursive beliefs about the criminal body. 1. Hanging in chains. The historical geography of gibbet sites will be mapped for English counties, with the aim of determining which features informed site choice. Variables such as the location of the crime, relationship to parish boundaries, local topography and viewsheds will all be recorded. The particular landscape of gibbets and scaffolds in London will also be examined, where the factors informing the location of display might have been different. Where locations of gibbets can be established, field study and historical cartography will be used to record natural, political and historical features of the site. Key questions here are what factors determined the location of a gibbet, and how did the presence of the gibbet affect the personal and social geographies of those who encountered them? 2. Burying the criminal corpse. Only very few human remains which have been subject to anatomical dissection or gibbeting are known archaeologically: what happened to the rest? The second part of this Strand aims to locate the final resting places of executed criminals and asks which factors determined the ultimate destination of the criminal corpse? It will consider the significance of personal and social identity, nature of the crime, manner of death, physical characteristics of the body and other variables. 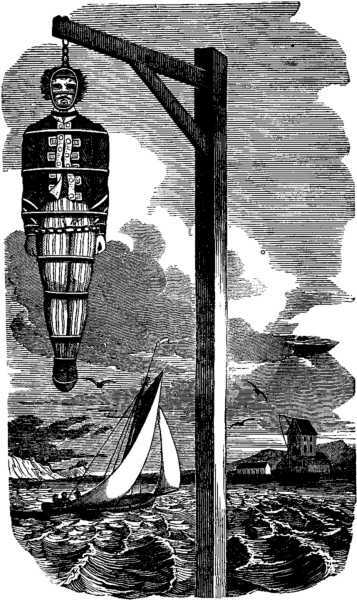 Hanging of WIlliam Kidd. 1837. Source THE PIRATES OWN BOOK, BY CHARLES ELLMS. Image courtesy of WIKIMEDIA COMMONS. A caza de dientes (Out Hunting for Teeth), 1799, Francisco Goya (1746–1828). Image courtesy of Wikimedia Commons. There is a long history of the medical use of 'criminal corpses'. The bodies of executed malefactors held particular potency in the eighteenth and nineteenth centuries. While several of the magico-medical uses of criminal corpses have received attention by historians, folklorists, and anthropologists, they have never been studied together to reach a deeper understanding of the significance of the medical potency of the criminal corpse. Furthermore, the subject has been little studied by historians beyond the early modern period. Led By Professor Owen Davies, Strand 4 will investigate how the curative powers of the criminal corpse were harnessed in the historiographically-neglected period 1700-1900. Using ethnographic sources, newspapers, and medical literature from the period, Strand 4 will explore the extent and nature of the use of criminal corpses to cure and protect the living in Britain, and Western and Northern Europe more generally. Identifying religious and cultural influences on the various healing and magical traditions will be central to the analysis. Regional comparative analysis. How far was the British healing/protective corpse tradition part of a broader set of shared medical practices and beliefs in northern Europe? Comparative analysis will also be informed by anthropological literature on the healing power of criminal corpses outside Europe. Historicising folkloric material: applying the methodologies and analytical tools of the historian to the voluminous but fragmented folkloric material, assimilating it with other historical sources and thus placing it in socio-historical contexts. Detailed case studies will be used to explore broader themes. British and Irish primary sources attest to the fascination which the criminal corpse in pieces exerted in both 'high' and 'low' literary cultures between 1750 and 1850. Building on recent interdisciplinary research into dismemberment as well as theoretical perspectives on relics and magical thinking, in Strand 5 Dr Shane McCorristine will place ideas about crime, superstition, and disembodiment within their historical context. Strand 5 follows the criminal corpse as it travelled through high and low cultures, and was disseminated in literary fiction. Eighteenth and nineteenth-century British fiction is full of criminal bodies in the form of punished corpses, vengeful ghosts, powerful relics and symbols of worldly debt. McCorristine builds on recent interdisciplinary research into dismemberment, as well as theoretical perspectives on relics, fetishism, and magical thinking, in order to look at how ideas about crime and superstition travelled from culture into literature and vice versa. A thorough study of this kind has been lacking due to the diversity of sources, the interaction with folklore and popular culture, and historic disinclination for interdisciplinary approaches.